The Southern Ocean is full of enormous factory fishing ships. At times it seems there are more of these ships than there are whales. I wish I was only being poetic here. These ships are easily longer than 100 feet. They practice three main types of fishing: netting, long-line, and bottom-dragging. Krill is the lifeblood of the Southern Ocean. These inch-long, shrimp-like animals feed the fish, the penguins, the other birds, the seals, and the whales. They are a keystone species. Without krill, the waters AND the land of Antarctica and its surroundings would be barren. It is nowhere near comparable to Monterey and the depletion of the Sardine. 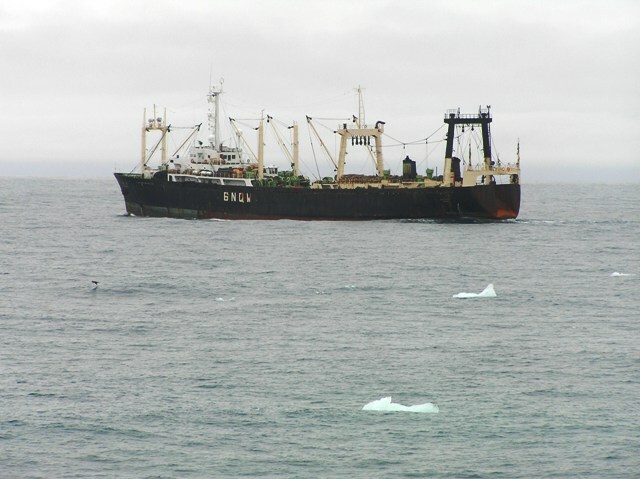 Ships similar to this one use gigantic nets to scoop up the krill by the ton. For bottom-fishing, nets are also used. But the nets are dragged along the seafloor. The seafloor is stripped clean, and the ecosystem is left in ruins. Not everything caught in the nets is fish. The last main type is long-line fishing. Here the ship trail lines that are more than 200-miles long. Yes! I said 200 miles, the distance from Monterey to San Francisco. As the long lines are set with hooks and bait, seabirds, especially albatrosses, try to get the bait before it sinks. They get hooked and drown. Since there is little regulation and enforcement, even the most simple of fixes, which could save thousands and thousands and thousands of animals, are not employed. Out sight, out of mind.